When dealing with rounded workpieces, sanding them by hand becomes an almost impossible task as it is not only tiring but also time-consuming. Whether you do wood works professionally or as a hobby, getting a tool that will simplify the job for you would be amazing. For all shapes sanding, a great oscillating spindle sander comes in handy, and this is the focus of our article. We will focus on the top three oscillating spindle sanders and also guide you through on what to consider when shopping for one. A quick guide on what you should consider when purchasing an Oscillating Spindle Sander: Read through to the bottom to see our buying guide which is more detailed. All WEN tools are known to be super-efficient and durable, and their WEN 6510 sander is no different. It tops the list of the most affordable yet efficient oscillating spindle sander that you will come across. It helps you simplify your work as well as save time and energy. You can not underestimate how much you can accomplish with this tool compared to when sanding by hand. It is great for straightening arcs, curves or sanding edges and any other shapes that could be hard to sand by hand. The tool is considerably quiet; thus you won’t feel like you are going deaf at the end of the day. It is also super-fast, thanks to its motor that generates 58 oscillations & 2K rotations in a minute thus helping you achieve your ideal shape within no time. Again, you will have six easy-to-change sleeves allowing you to have a full range of shapes/curves to match your desired outcome. Cleaning up after you’re done working will be much easier thanks to the 1.5-inch ultra-convenient dust port. It gives you the option to go ahead and attach your most preferred dust extractor thus minimizing clean up. You are thus guaranteed a clean work surface all the time. 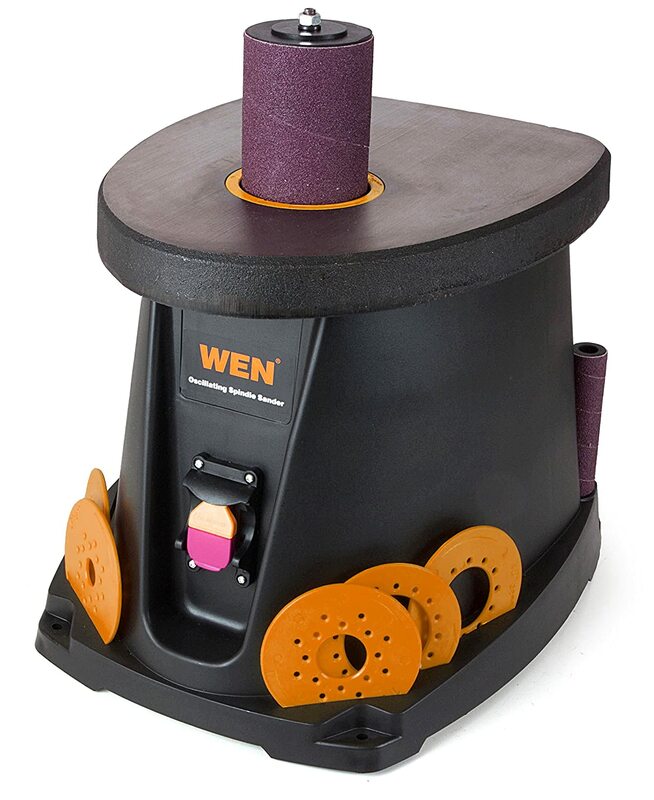 Also, all your accessories will be in one place as the WEN 6510 Spindle Sander features an onboard storage. This means that you will be more organized and be able to access any of the accessories quickly when need be. 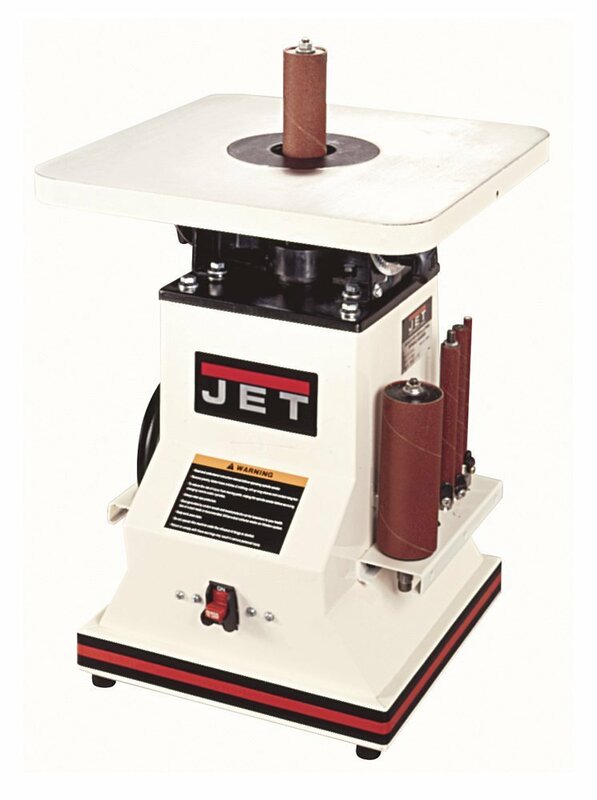 Lastly, the WEN 6510 Spindle Sander is the ideal unit for stable operation. The design offers not only enough worktable for both larger and smaller projects, but also enough stability for any kind of project. Thanks to its heavyweight and sturdy design combined with the pre-drilled holes perfect for mounting, this unit has maximum stability. And, this makes your work easier, quicker and safer. It is everything that any craftsman in sanding projects would find helpful and appreciate. Smoothing edges will never be this easy thanks to the Shop Fox W1831 Benchtop Spindle Sander. Whatever edge you need to be smoothened after cutting it with a scroll saw or bandsaw will be so easy and quick if you do it with this tool. It gives 58 oscillations in a minute thus resulting to even sanding on any edges. It is the ideal sander for absolute precision when on various projects. Whatever your sanding task is, you will find this sander helpful thanks to its six sanding sleeves diameters that enable it to handle various tasks perfectly. Also, thanks to its onboard storage, you can have all the necessary accessories in one place for ease of access. The onboard storage also helps in creating more working space while promoting better organization for a stress-free working time. Again, the W1831 Spindle Sander by Shop Fox features various inserts that closes the gap between the drum and the table insert thus reducing pinching risks while offering better support for various sanding jobs. Again, the built-in dust port enables you to maintain a clean working space and minimizes time used for cleaning up after work. It also features a locking power switch that helps in protecting the sander from unauthorized use as it has a removable key. This gives peace of mind even when you are not in your garage or workshop because you are sure that no accidents are likely to happen. The motor is powerful enough to support various sanding jobs, and you can rely on it to get excellent results for a long time. The working table size is also enough for larger projects and given the price and its durability. You have all the necessary reasons to purchase it. When you think of how long it takes you to smoothen just a single curve to how you want it, I have no doubt you would consider getting a unit that will make the process quicker and more efficient. No storage space for the washers. If you are having a hard time smoothening any hard-to-reach spots or when sanding contours, get the JET’s 708404 Spindle Sander and make it easier and enjoyable. This particular spindle sander has been designed to reach all those corners that other types of sanders can’t reach. You don’t have to spend too much time trying to attain a certain precision. With this sander, everything is achievable. It is ideal for scratch-free sanding finishes thanks to its oscillating action. It makes your work more presentable, and you will be happy you found it sooner. With its five spindle sizes, it stands way better than most standard sanders on the market. Dust infiltration will be a past-tense with this sander thanks to its great design and all safety measures have been considered to ensure a secure sanding. You will also have a more organized working area as you will also get an onboard storage for the five complete spindles and all the other accessories. Again, with the JBOS-5, no slipping when smoothening or straightening any edges and curves thanks to the non-skid rubber feet on this unit. This, combined with its powerful induction motor, makes you more efficient and you will be in a position to handle even the toughest sanding jobs with ease. Also, the table inserts, combined with the 2-inch built-in dust ports prevents debris and dust from falling in the motor thus no likely interference with its performance. This will thus enhance its durability and also give you an easy time maintaining it. This is especially useful for anyone that uses a spindle sander frequently. Generally, this is a great sanding unit to place your money on. It has the necessary features that make sanding easy and the outcome great. The powerful induction motor gives a reliable performance in all your sanding projects. The tilting table makes it easy to handle various sanding jobs as it promotes flexibility and you will be able to deal with various material sizes. You will also to do bevel sanding jobs which are a huge plus for this type of a unit. The sander also features various safety features that promote smooth sanding operation, and the price is just right for its functionality and durability. We had mentioned the things to consider when purchasing the best Oscillating Spindle Sander but in brief. We also listed the best oscillating spindle sanders reviews and in this section of the buying guide, we aim to include more factors to consider but in a more detailed manner. Different projects will require different levels of sanding. For professional craftsmen, there is no compromise. You must have a scratch-free sanding finish, and you have to do it quickly to save on time as this translates to more money. The more powerful your motor is, the faster your sanding jobs will be. Also, a more powerful motor handles various sanding jobs with ease hence more preferable. To avoid accidental start-ups or slipping off your sander as you work, ensure that necessary safety precautions such as an on/off switch and non-skid feet have been incorporated. Ensure that all the necessary accessories that should come with an oscillating spindle sander are included to avoid unnecessary expenses or to waste time waiting for them to be sent separately after your complaint. The design of your unit will determine how stable it is to sand with. The more stable it is, the better it is for sanding. Sanding with an unstable sander makes your work even harder, and the results might not be that pleasing. To some unit, a heavyweight design makes them more stable, while others do great with pre-drilled holes meant for mounting. The number and type of sanding sleeves included determines the types of curvatures that you can sand. If you like to try different projects, don’t limit yourself with just a few sanding sleeves. Get what you need to support your creativity. To ensure that you will have a dust-free working area and to minimize on cleaning after work, get a spindle sander that will make it easier for you. Ensure that the sander you are about to purchase is compatible with various dust collectors to avoid extra costs. The size of the sander’s worktable determines how smooth your projects will run. You need enough space for both small and larger projects. Also, the construction of the worktable matters a lot in terms of durability. There is no compromise when it comes to durability. To avoid disappointments, always go for a durable oscillating spindle sander. A spindle sander does not have to be too expensive to do the job. As long as it has all the necessary features, it will work great for all your projects. 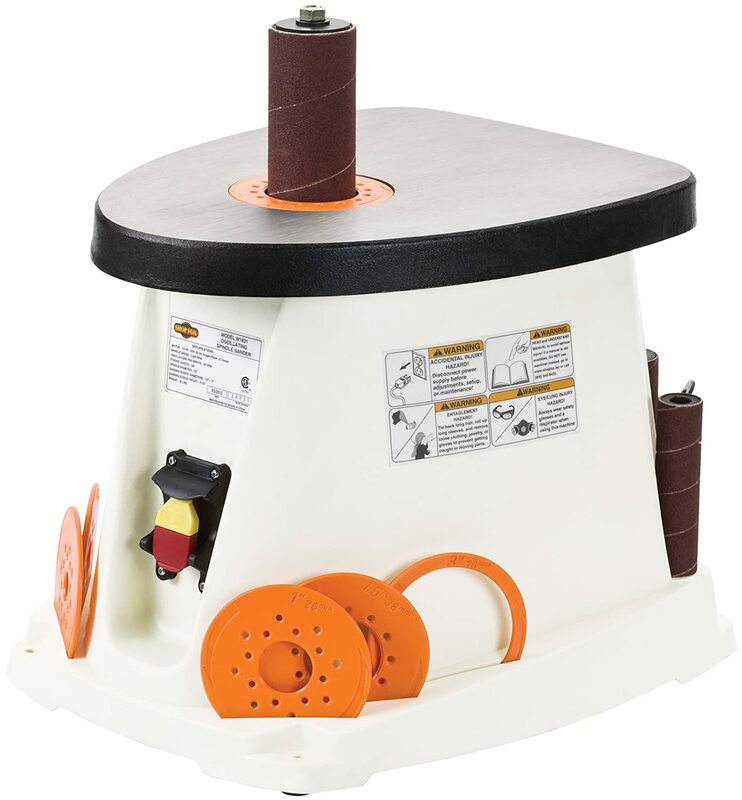 WEN is a re-known manufacturer of oscillating spindle sanders among other great manufacturers such as Shop Fox, Jet, Delta Woodworking, Powertec, Grizzly, Ryobi, Triton, Ridgid, and Craftsman. They have been on the market long enough to know what it demands. You don’t have to hand-sand the inside of every curve you make. A great spindle sander saves you the hustle. The top best spindle sander is the WEN 6510 Oscillating Spindle Sander. It helps you save more time, more energy, and be able to tackle various sanding tasks with great precision. As our article shows, there are several considerations that you must make before purchasing an oscillating spindle sander. There are various Sanders, for straightening curves and sanding edges, and you just need to know exactly how you want to use it and how often to get the best. Make your order now and enjoy sanding the easy way!